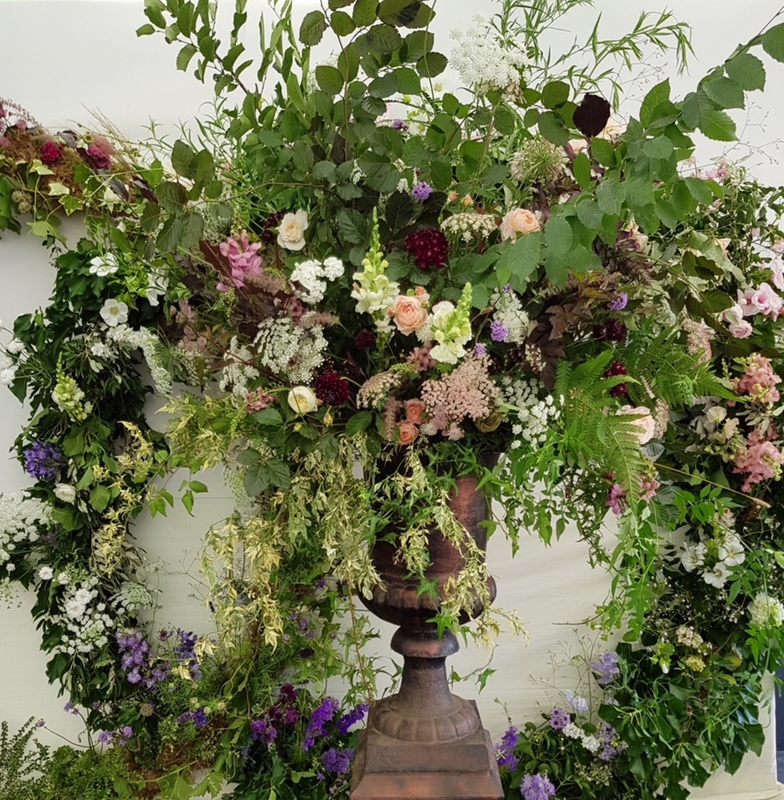 On a glorious July weekend, Emma and Sunita (both sit on Blue Patch’s Executive Board) joined me (Jane from Blue Patch team) to discover what was blooming at the RHS’s annual Hampton Court Flower Show. First stop: iced Pimms beneath a tree, retreating from the midday sun. Marginally cooler by 2pm, we visited The Family Garden, featuring Blue Patch member Ellen’s PearPod. Ellen’s pod provides a shady retreat from the heat, but is equally snug on a fresh autumn day with a blanket and good book! 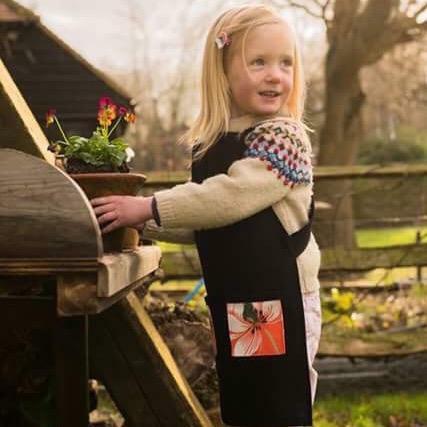 The Family Garden’s Designer Lilly Gomm created a relaxed environment for kids to scamper around in and learn about wildlife conservation. She even had a full on wall of logs and nesting tubes for solitary bees, spiders and beetles. If you don’t have as much space, you can still cater for wild residents. 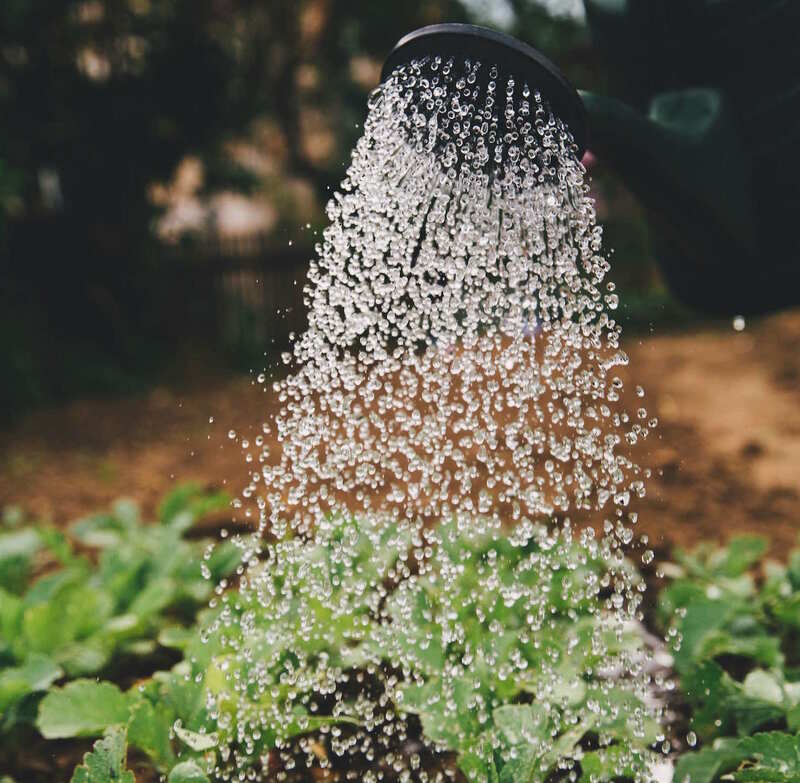 Companies like Beepalace and Green +Blue for bees and birds, and for recycled products ashortwalk make bird feeders to feed the local feathered residents. To attract pollinators with wildflowers, try Seedball. If you’re looking for a sweet gift to get kids gardening, have a look at Denys & Fielding’s Budding Gardener Giftbox. On the subject of play, try this enchanting playhouse for size! 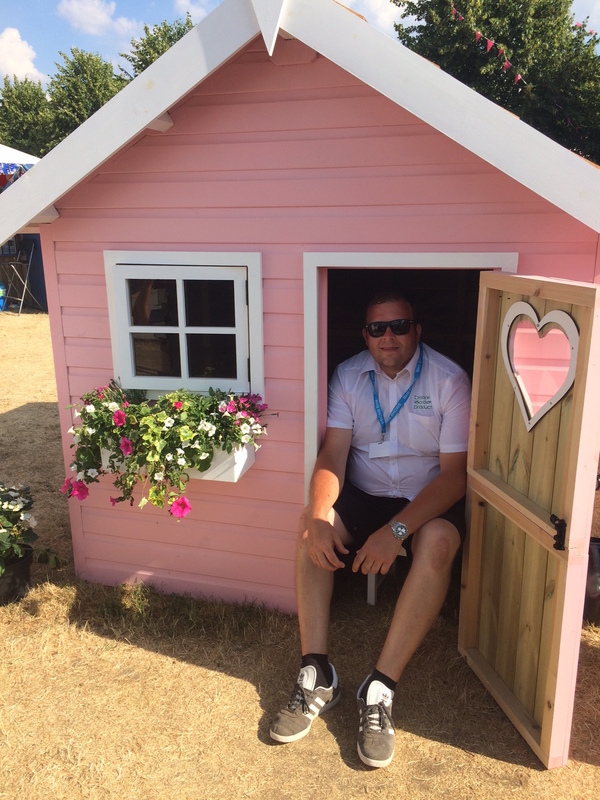 Creator Chris Evans was a good sport and took up residence in his charming playhouse, a new line for Bespoke Garden Products based in Wales. The idea started started as a gift for his two girls. 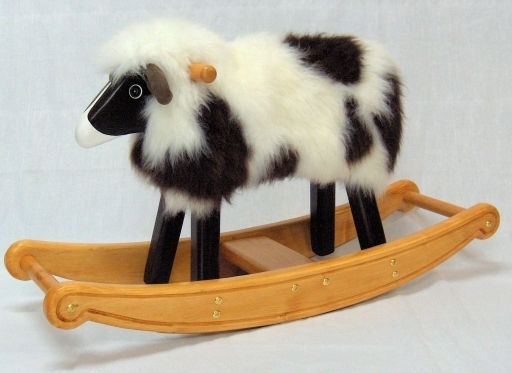 We could imagine his girls may quite like The Rocking Sheep Company (made in Harlech, Wales) to complete the rural scene. Continuing on the theme of play, we nipped into the Country Living Tent (fondly known as ‘Boil in the Bag’ tent by traders!) 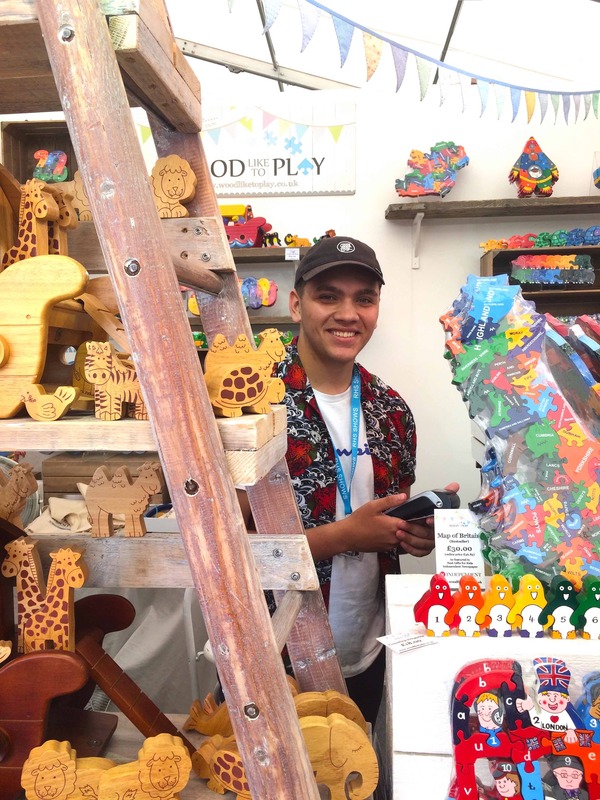 where we met Jak Baddevithana who proudly displayed his mum and dad’s creations. They make these wonderful toys Woodliketoplay.co.uk in Staffordshire. 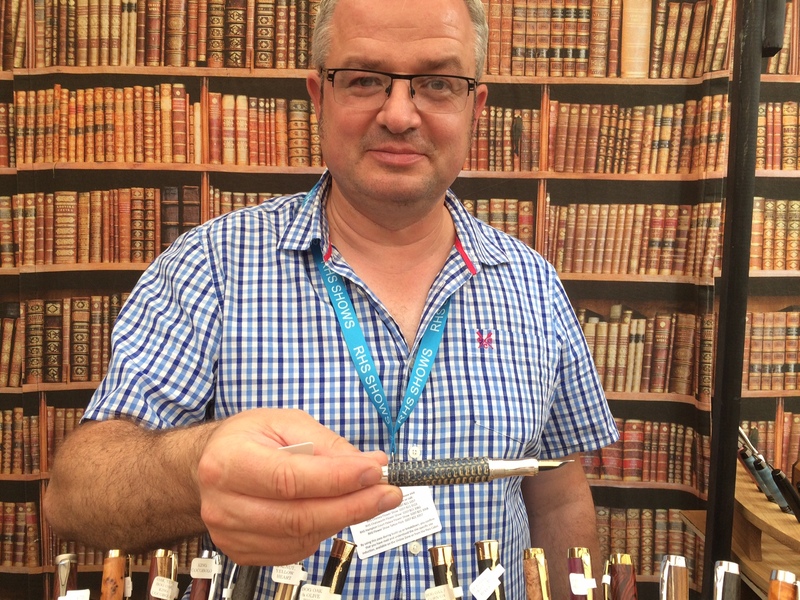 Ian Darbyshire makes Hand Turned Pens in East Yorkshire. I wanted to know which was his strangest creation and he didn’t hesitate, it was his ‘shrunken corn on the cob’ pen. Ian even ate the corn himself! In a tent full of extraordinary floral arrangements, we were blown away by the glorious abundance by Flowers From The Farm. They were designed by Floribunda Rose artist Victoria Blüm using flowers from 14 different UK Flower Farmers. 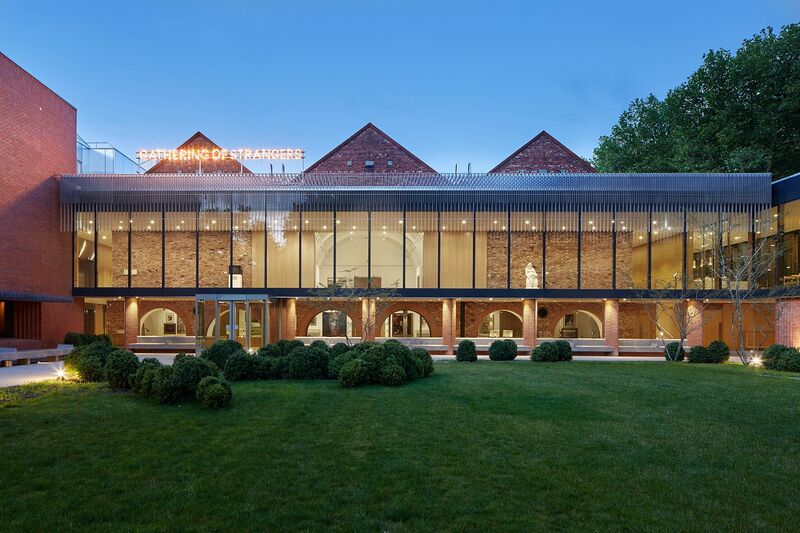 Flowers From The Farm is a not for profit organisation that has networked over 500 local growers and was founded by the inspirational Gill Hodgson. This initiative is so important to support and promote so that our own floral entrepreneurs thrive. We can do this by encouraging florists to buy from local growers, saving flower miles and generating jobs. Back to the heat and more show gardens. 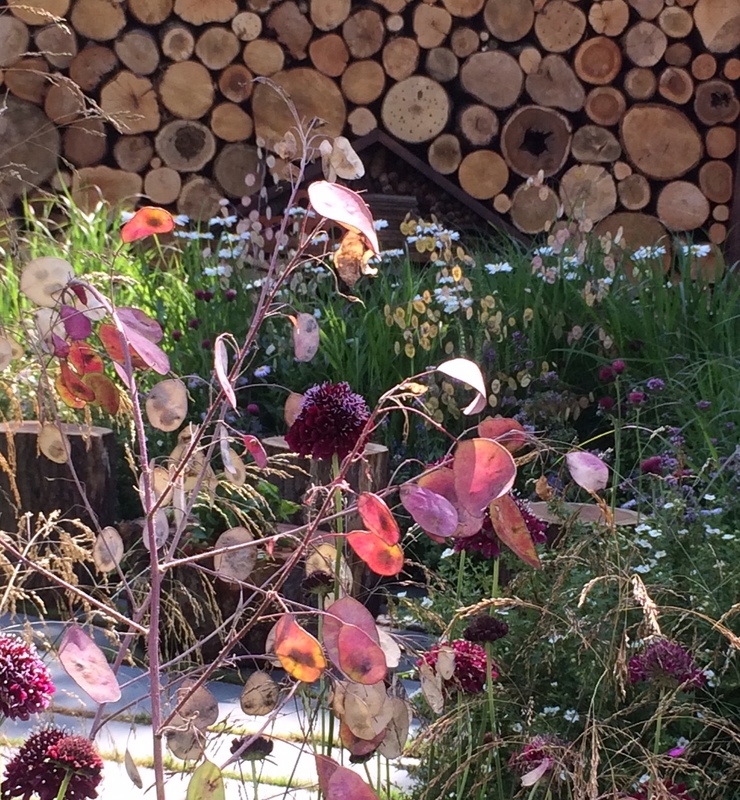 We loved The Style and Design Garden designed by Ula Maria. 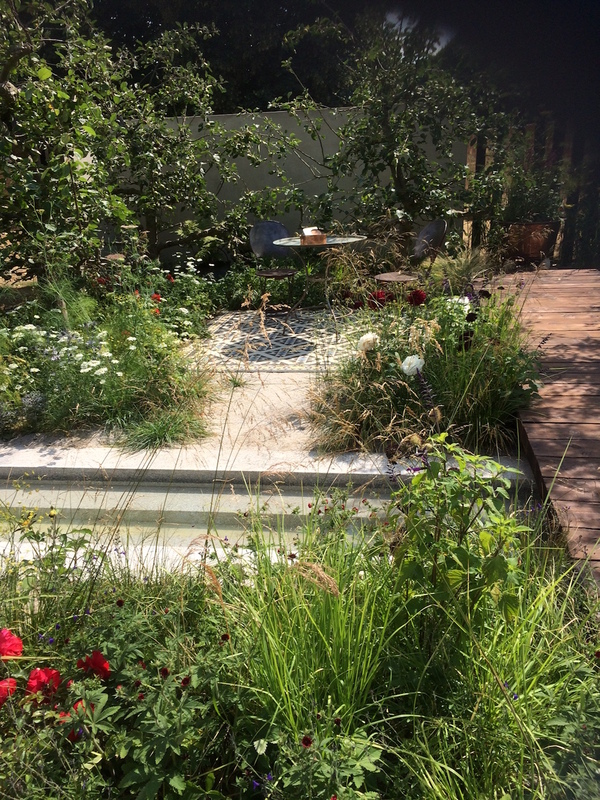 A spin on the outdoor room, the small space utilised a pretty tiled terrace, wooden bridge and minimal ‘long pond’. 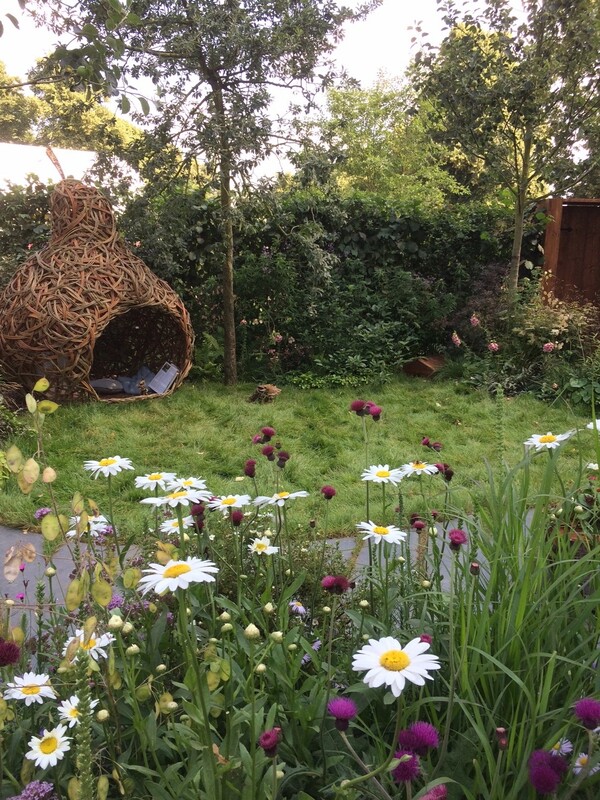 The Style and Design Garden designed by Ula Maria. 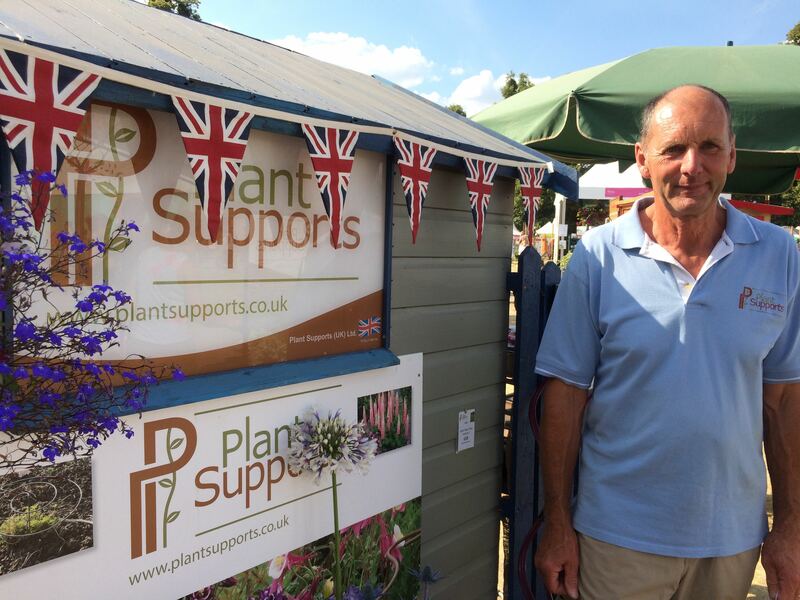 On a practical note Tina and Colin Lord manufacture plant supports in Worcestershire using British Steel. So useful for providing armature for plants to add structure and drama. These supports are PVC free, powder coated and made to last. What better way to enjoy your garden – an outdoors feast! 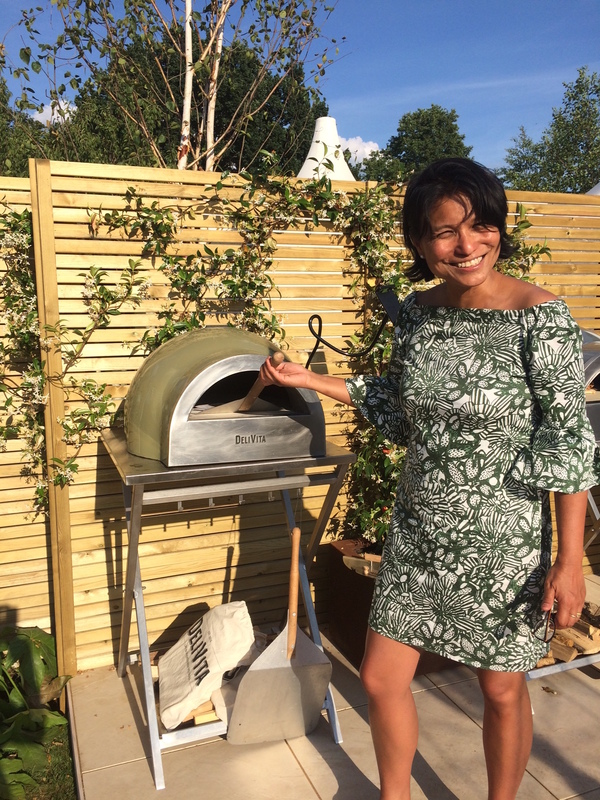 Sunita shows off DeliVlita’s superb lightweight oven, add a few logs and some pizza dough and cook using 1/3 of the fuel of a conventional BBQ and the food will be healthier too. This ever resourceful company have produced a cookbook and their own pizza dough. FIY you can cook veggies and fresh fish in your DeliVita in no time at all. The ideal ‘camping oven’ too it’s light enough to carry and safe as the outer shell is cool. 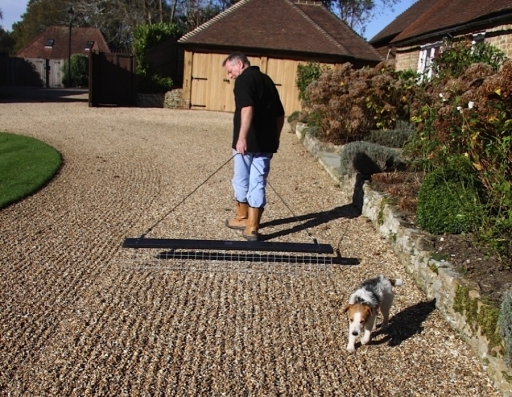 If you love a well tended drive, we suggest a Gillhams Garden Rake will sooth unruly stones in a fraction of the time. 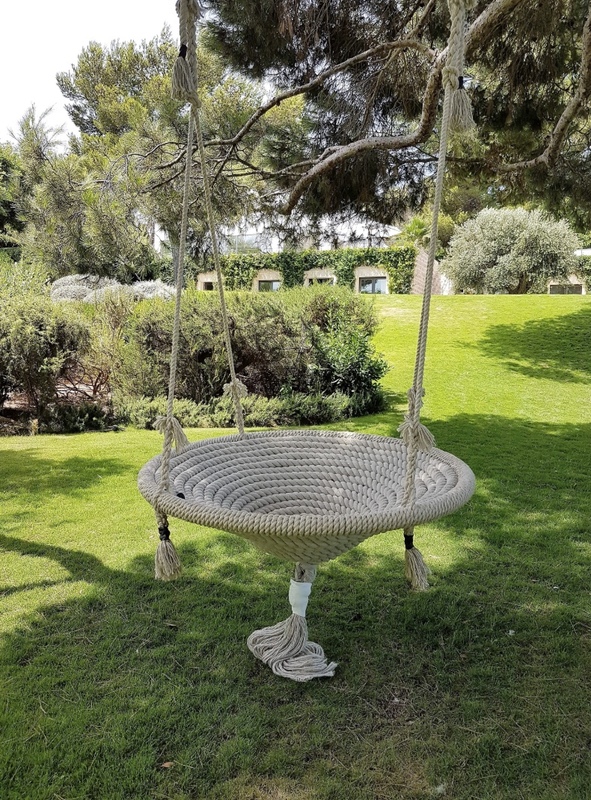 To make your gardening experience go with a swing we’ve got some wonderful companies on Blue Patch. 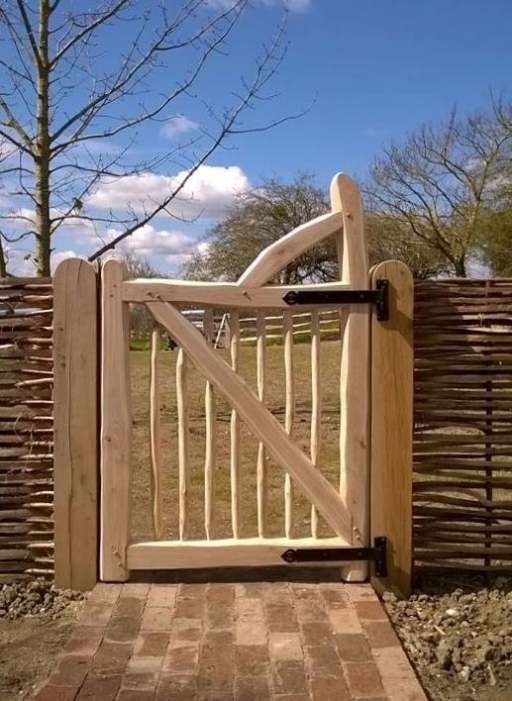 Try these handcrafted gates, works of art with a practical application, made from sweet chestnut by Mark Harman in Kent. 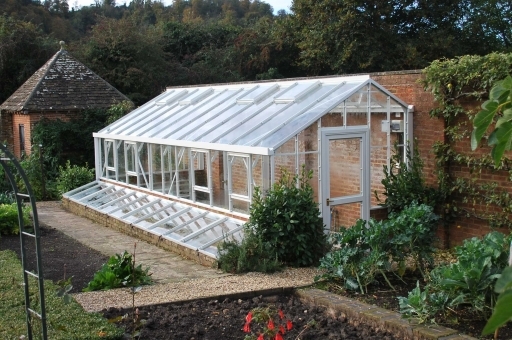 Grow your own food in style when you invest in a bespoke Dovetail Greenhouses. 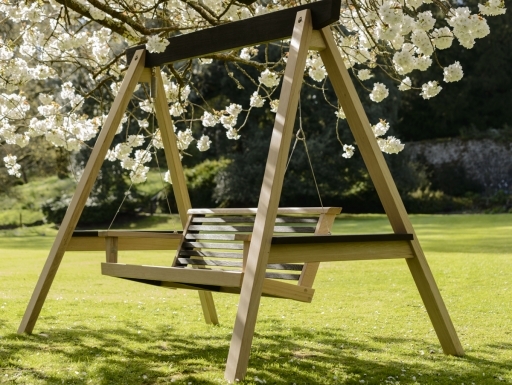 More great ways to hang around outdoors from Sitting Spiritually and JC Gardens. Have a look at our fab gardening courses and products here and dig in to some super sustainable gardening.